The White House announced today the acquisition of Sand Dunes at Sunset, Atlantic City, a painting by the renowned African-American artist Henry Ossawa Tanner. This is the first painting by an African-American artist to be a part of the White House perma nent collection. The painting will be unveiled by the President and Mrs. Clinton at a White House ceremony on October 29, 1996. Following the unveiling, the painting will hang in the Green Room of the White House. 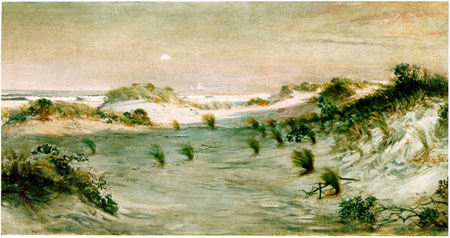 Sand Dunes at Sunset, Atlantic City , (c. 1885, oil on canvas 29-1/4 x 58-3/4 in.) is a landscape with a "view across the cool gray of a shadowed beach to dunes made pink by the late afternoon sunlight. A low haze over the water partially hides the sun. " The painting is considered one of Henry Tanner's largest, most artistically ambitious and most beautiful pure landscapes. Tanner (1859 - 1937), the son of an African Methodist Episcopal minister and a mother who conducted private school in her home, was born in Pittsburgh, Pennsylvania. He studied under Thomas Eakins at the Pennsylvania Academy of Fine Arts and was greatly influenced by Thomas Hovenden and by Hovenden's genre paintings of the 1880's. Although he spent over half of his life in France where he found an expansive and more accepting environment, he always considered himself an American. He made periodic visits to the United States and served as a lieutenant with the American Red Cross during World War I. In the Spring of 1994, Mrs. Clinton, Honorary Chair of the White House Endowment Fund, and Endowment Fund trustees worked with the late Sylvia Williams, former Director of the Museum of African Art at the Smithsonian and David Driskell, a leading expert on African-American art, to look for a work that would be compatible with the White House collection and would complement one of the public rooms. "The works of Henry Ossawa Tanner remind us that talent has the power to transcend prejudice. It is a deep honor for the President and me to honor Tanner's contributions to both African-American culture and the cultural life of our Nation. We are so proud to add this painting to the White House permanent collection." said Mrs. Clinton. The painting was obtained from Dr. Rae Alexander-Minter, grandniece of the artist, by the White House Endowment Fund for $100,000. The White House Endowment Fund is a non-profit charity and wholly-owned subsidiary of the White House Historical Association. The purpose of the Fund is to raise money to provide permanent support for the White House collection of fine arts and furnishings and to preserve the historic character of the public rooms of the White House.